Z. Smith Reynolds Digital Collections materials are derived from the physical documents housed within Special Collections and Archives, and are made accessible to the public as historical record. Some materials within our collections contain offensive images, language, or other content. These records document a time and place in history, serving as a portrayal of the social mindsets and occurrences of their time. 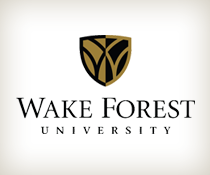 They do not mirror the current views of Wake Forest University or the Z. Smith Reynolds Library, which seek to encourage a vibrant and diverse learning community.